Villa Wendy is a new build casa particular with bar and restaurant in the same building. Located in Puerto Escondido's city entrance, a small fisherman's town filled with tabacco plantations. One room with air conditioning, hot water and private bathroom. 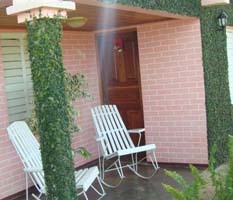 Excellent greetings from the casa owner who is always approachable for any useful cuban suggetions and tips. Wendy is an excellent cook who prepares typical season delights and terrific Mojitos.